I think I might just be the luckiest girl in the world. Five minutes down the road from my college there is an adorable little place tucked away beside Carphone Warehouse and KFC; a bookshop (although the word shop might imply that you buy things). Literally every book in the place is free! No catch, or anything. The policy is that you choose up to three books, get them stamped, and leave very happily. I only visited once, during a free period, so was a little short on time to hunt properly. I chose the above three: Bridget Jones' Diary, The Devil Wears Prada and Good Behaviour. I had the second Bridget book given to me by my mum's friend, so I've been dying for the first one (however by the time I finish I could probably end up with the third second-hand as well)! 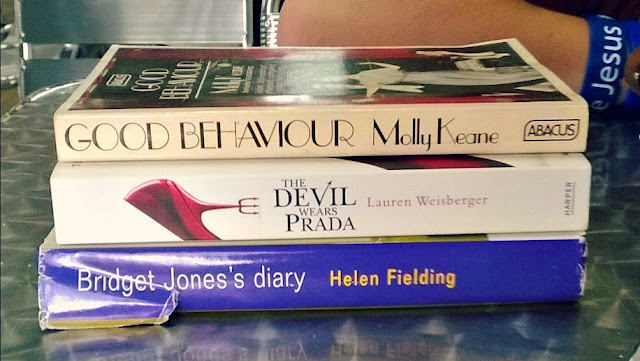 The Devil Wears Prada simply caught my eye as something I'd heard about often, but never actually seen or read. It's the one of the three that I've started, and I love it so far! And Good Behaviour I admit I only chose because I had about a minute left and saw a 1920's style cover, therefore I know nothing about. Maybe that'll be a good thing..? I'm hoping to take a trip down tomorrow and see if it has any of the books on my English Literature syllabus, that would be a godsend! I'll keep you up to date on anything else I pick up from this adorable little place, it won't be the last time I lug a handful of books through college for the rest of the day!